With your screen facing down, look on the right side of the phone for the SIM drawer. Slide your metal opening tool just above the drawer and push upward. Use gentle pressure (never force anything) and make your way around the perimeter of the device. The phone back is just clipped on—no adhesive here! Do not use a metal opening tool to pry your phone open. It will leave ugly scratch marks on the soft plastic bezel. Use a thin (but hard) guitar pick. Remove the eleven Phillips #00 silver screws and one black (circled in yellow) securing the midframe. The screws have different finishes and slightly different shapes. Make sure you organize them so that you can reassemble the phone correctly. The back case of the phone has two separate pieces; we will pry them up now. Slide the spudger under the back case (mind the motherboard under it—keep your clearance as high as possible). Be sure you use gentle upwards pressure. iFixit Jedis know too much pressure results in poor repairs. Now that the back case has been completely removed, it's time to disconnect all the ribbon cables connected to the two boards. Disconnect the antennas from both sides of the top and bottom boards. On the bottom-left side of the phone is a little board that goes with this dual-ribbon board contraption. Be sure you give the board a little push with your plastic prying tool—it'll eventually loosen. Gently lift the board from the top with the power button/volume assembly in your fingers, and pry the bottom part of the board free of the phone housing. The cables on the bottom can get caught on the bottom board—just be gentle as you lift it out of the phone. In picture 3 there is a red box around a little plastic piece that comes with this assembly. Remember this tucks UNDER the board once you're putting it back in. That little black piece that is outlined in red seems to be the environmental light sensor. the component itself will slide out of the black plastic holder, making it easier to position correctly when putting it all back together. When the author says it "goes underneath" he means it faces the bottom of the phone, the same direction as the earphone connector. Note: the bottom board is glued or taped to the chassis, you can gently insert a flat plastic spudger underneath the board to ease it off the adhesive. I just got the samething, I'm thinking maybe defective replacement part or faulty/broken connectors. Btw where did you buy your digitizer/lcd Amazon? I'm gonna wait to see if there's an easy fix before try returning the part. Got a repair shop to do the work for me. The phone works, the ear piece did not work the first time around , and had to return it to the shop. The earpiece works now, but except the ring tone is gone. I depend on the vibrations to alert me to incoming calls. What needs to be done to fix the remaining problem? Make sure all of your ribbon cables are free of the board. Use your plastic prying tool and lift up on the board. If all of the cables are out of the way, it will come free. Now you need to get that battery out of there. I used a sturdier metal prying tool to CAREFULLY slide under the battery to free it from the adhesive. An old credit card might work better and pose less risk to the battery. Do not puncture or deform the battery, or it may leak dangerous chemicals or catch fire. Ready to get hot and steamy? Get out that heat gun baby! Keep your heat gun about 4-6 inches above the screen of the phone and make even passes back and forth over the glass. Keep the heat on it for 1-2 minutes. Now let's get that screen out! Take a thin prying tool and slide it between the glass and the plastic housing of the phone. Go around the perimeter of the phone and lift the glass free. Do not slide your opening tool in too deep while doing this. Don't slice any cables! There's one in the upper-right corner, plus a wide, flat one with two connectors on the bottom, towards the middle of the screen. Carefully pry the ribbon glued down on the inside opposite the screen. Once that is free, slide it and the small connector through the case just to the side of it out to free up the screen to remove. Be sure when replacing the screen to use a good bit of double-sided tape. I had problems with the bottom right corner coming up and had to disassemble and reapply tape. Problems? When I replaced this screen I couldn't get it to turn on at first. If this happens, hold the volume down and power buttons simultaneously. This will reset the phone and hopefully get it to recognize that new screen. When re-assembling the device, there is a chance your clips will not fit correctly over the volume and power button faceplate. A little force around it should snap them together. Can I ask questions ? 142 участников успешно повторили данное руководство. Hey i had to replace my screen on my lg g2 before this guide was up wasn't too bad to do, but my phone gets no signal bars anymore. I ordered new antenna wires and replaced them both still no signal bars just a red x most of the time in certain places ill get a bar or 2 but only for a min or so what do you think it could be? also both boards came out together when i removed them. Take your time and follow the guide and you'll do fine. Read the guide, look at all the pictures, then carefully re-read each step and look at each picture in each step. There are a couple 'gotcha' boards/cables that you could destroy if you're not watching and being careful. It took me roughly 2.5 hours to do this because I was being extra careful and took some breaks to rest my eyes. Note: You'll need to get a roll of double-side phone tape to go with your new screen to stick it back to the frame. I accidentally ordered screen for D801, but I have D802, I didn't wanted to spend another fortune for the display assembly and I ordered lcd cable for D801 and hope it work's, but it weren't turning on, so I forced right side connector to the motherboard, it lighted up the display, but half of the touch weren't still working, so i tried to reconnect original cable (D802) but it didn't worked or if it did, it lighted up just for a moment, what could be the problem and how could I fix it? please help me. Installed the screen and it turned on. I realized i forgot the screws, took the back off, put them in and put it back together and now the screen is black... Any ideas or suggestions? Did you hold volume down and power button at the same time to reset? Hi guys, I am wondering if you can help me. I have followed this guide and replaced the screen on lgg2. Unfortunately when I turn the phone on the screen itself does not come on (there is no image). the phone does seem to be working though. If I attempt to type my password at the initial screen the phone vibrates to tell me that I have typed it in correctly (because I can't see it!). Any advice would be greatly appreciated. Did you ever figure out what the problem was? I'm having this same problem. I've got the same problem, so frustrating! I am getting really low wireless internet signal after replacing the screen. Does anyone know what the problem could be? Check your antenna connections. I had the same issues on a IPhone and checked the connections on the antenna cable and reconnected it. Please be careful and show love not force on those connections. Thanks a lot for this tutorial ! I replaced LCD and Digitizer on my phone, but the phone won't turn on since. Nothing happens when I press the buttons (of course I also tried the power + volume down buttons). The only thing that happens is the front red LED flashing when I connect the phone to the charger. Could it means there is a short-circuit somewhere ? Do I have to change the mother board ? 2. If that doesn't help, perhaps try to pull the battery and hold down the power button for about 30 seconds, then reconnect and try to reboot. 3. Perhaps your screen is bad? Does plugging the old one back up yield the same results? 4. If none of these help, check all of your connections make sure your ribbon cables aren't torn and are completely plugged in. 5. Let me know what you find. Hi, i just had the same issue. Did you found the answer? I've checked all the solutions listed and nothing at all. Thank you in advance. No, but it is best to not have the boards and connections left exposed. We replaced the screen, and it turns on, but won't stay on for more than a second and then the backlight turns back off. Any idea what the issue could be ? I'm no expert but this may be due to something obstructing the proximity sensor - like a piece of dust or a rubber gasket... If this is the case, the proximity sensor it registering that there is something covering it and it therefore tells the backlit to switch off (thinking the phone is in your pocket for example). Hope this helps. I'm having the same problem after my screen was replaced (I had it done by an official shop). Do you have the solution to your problem yet? Im having the same issue. were you able to resolve it? Maybe someone can help with an issue I been trying solve for a couple of days. I have a Sprint LG G2 the Screen and LCD were cracked so I replaced both the LCD and the digitizer but when I reassembled the phone and power up everything looks fine but the digitizer is unresponsive. So disassembled and reassembled but I get the same results. So I thought maybe the part was defective so I contacted the part supplier and they sent me a new part and I'm getting the same results with the new part as well! Same problem here...did you ever solve it? I just replaced my screen last night but I learned that didn't need to take it apart nearly as much as this guide covers. In the end I could have done it without removing any circuit boards or the battery. My screen was already coming loose on the sides so it was easy to remove. The less you take apart the less likely you will run into problems. Help! How and where do I reinstall the double sided adhesive? On the front of the midframe. I'm in need of some help. I replaced the digitizer and Screen as one new unit on my wife's LG G2. At first it worked except the microphone wouldn't work and the proximity sensor was an issue. I found the proximity sensor gasket still in the old phone, disassembled, re-assembled with the gasket. And now it won't boot. It's gets to the LG screen and turns off. When I plug it in to the computer or charger, it just repeats the cycle,…turns on, gets to the "LG" screen, then turns off again, and continues to repeat. Jack Hansen ...... Thank you!!! My screen wouldn't stay on after replacing the LCD and your solution worked. I had dust under the proximity gasket.....took it out, cleaned everything and it works great now!!!! Thank you! Hi I am unable to find the LG g2 display anywhere in India, could you please suggest me where I can get the LG G2 display. Hi guys! I been a cellphone tchnician for 9 years now with a company that gives services to 30+ stores. Personally I have worked about 5 LG G2 that have presented this situation. 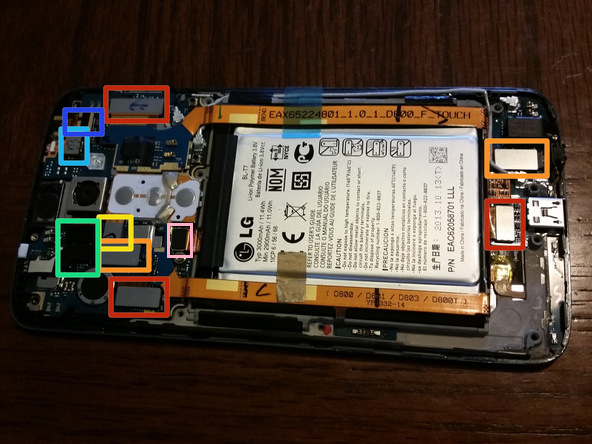 I have observed that when SCREEN WORKS in other LG G2 but DOES NOT SHOW IMAGE on a certain LG G2, they have had some capacitors in front of the right Main Flex BOARD Connector in the Main Board. They are two black capacitors that are very fragile and can be easily damaged in any replacement process and will not be able to pass information from the Main Board to the LCD. This will give you NO IMAGE and can only be repaired by replacing those capacitors. Will require soldering skills. I have not found those capacitors to buy then yet. Still, I have taken them from water damaged LG G2 Boards. Hope this illuminate your work! Hey guys I replaced my LCD Display and digitizer after I have broken them.When I tap twice fast when yi want unlock my phone it doesn't react until I click unlock button which is on the back of the phone and when I want to lock phone than he is reacting and locking himself after I tapped twice fast..My phone is LG L Bello so any help I have been trying everything but I can't fix it.. Thanks for the guide. Along with a video for a LG G2 screen replacement, I was able to replace my screen/digitizer. I was having trouble with removing the battery though, so I left it in while I heated the screen. LG G2 (t-mobile) slightly different but procedure sam--- screws>cables>LCD>screen! Hi everyone. I replaced the lcd, the phone turns on ,i can see everything but the TOUCH is not working. Any odeas? Hi everyone. My TOUCH is not working after replacing the lcd and digitizer. Any ideas? I have LG G2 F320L (korean version). Can i use G2 D802 touch panel in my G2 F320L? Is there any size difference among both models touch panel? Thank you very much for your guide. The screen of my G2 stopped working: I have a black vertical band of few millimeters on one side of the screen. The touchscreen works properly on the whole screen (also the black area) and the glass is perfectly intact (no crack in any place). Since both touchscreen and glass are intact I am starting to think that the problem is with the connector of the lcd to the board. Do you have any experience with this? Any advice on how I can troubleshoot? PICTURE in my profile image. Thank you. Followed this guide step by step... the phone fired up first time with no dead pixels. There are laser-cutted adhesives available for this phone. To everyone whose screens are not turning on, or are showing lines. There is a small ribbon with capacitors on the bottom of the phone that is touching the grey antenna. Those can't touch or you will have problems. Add a small piece of electrical tape there over the capacitors and you should be fine. To everyone having a blank screen or lines in the screen. There is a ribbon with capacitors on the bottom part of the phone under the grey antenna. Add a small piece of electrical tape to keep them from touching and it should work just fine. I am replacing the glass & digitizer; it came as one unit. My question, since it is one piece, is the step with the heat gun to separate components still needed? Hi Richard, it's been a while since I did this guide. From what I can tell in the pictures you will still need to use heat to remove the old screen. No, it's not. The display & digitizer unit is attached to the midframe by some adhesive. You can simply open it as you would open the back cover. Well, there are easier methods to disassemble the display. You don't need heat and the battery can stay in place. But thanks a lot for this guide! Thanks. Needed to replace digitizer due to unresponsive touchscreen. Overall these instructions worked. My kit included LCD + digitizer in a frame so there were several other items that had to be moved to the new frame. Then I got the static/snow/multicolor dots. I had to reset one of the connectors. Then the screen would go black right after booting but in certain room lighting it worked. I found a tip about putting a folded piece of paper over the proximity sensor. That also allowed knock on to work again. It's been working fine for a week now. I completed this guide (it was very helpful) and it was also my first android screen replacement. The only problem is despite using some adhesive tape the bottom of the phones display is coming away form the case. Does anyone have advice for this? Hi George, I'm glad you found the guide useful. Unfortunately due to quality issues with screens and aftermarket parts it may not be possible to get it fully sealed. I have had mixed results. I recommend a case (similar to Otterbox) that surrounds the screen and holds it down. If you can get Thermoweb Super Tape it does tend to hold better than the adhesive that came with the screen or other double sided tape. Good luck! My D800 is stuck in TWRP Recovery, due to only half the screen(lower) being touch sensitive. I’m assuming that this is because of a slight crack along the top edge of the screen. However the device display is fully visible and the crack can only just barely be seen. Anyone know a way to get rotation to work? Jeremy Thimpson, thanks a lot for Your great guide! It was a little bit difficult but I’ve managed to fix my LCD screen within 2 hours. Not bad for an amateur. What temperature did You used with heat gun? Advice for other Jedi- try to make short breaks off, let your eyes and brain take a break and don’t use too much force. I probably over looked this but i dont see how to fix the digitizer replacement part……goes to screen replacing after 9. A little help? This was great. Although I got a screen with the digitizer, and I had to move over the camera, sensor, and some other round thing, it all worked! One thing: the speaker didn’t work at first. It’s the black cover at the bottom. When I reassembled everything, I didn’t have that flat board (in between the two connectors) laying flat against the copper plate - you’ll see it. I had it flipped up, resting against the battery. Once I lowered it and reattached the cover with the speaker, it all worked. Thanks for the step by step guide!